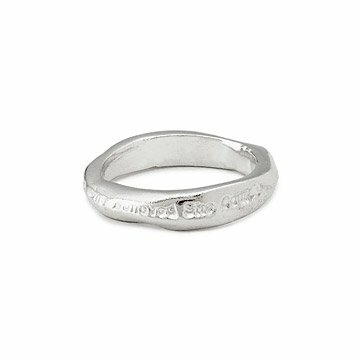 Sport a wearable reminder to chase your dreams with this handcrafted sterling silver ring. Stamped with heartfelt encouragement to chase your dreams, this organic-shaped ring is hand crafted from sterling silver. Using her experience as a sculptor, jewelry designer Jen Pleasants creates a wearable piece of art in this refined ring that"s equal parts rustic and feminine. Handmade in California. Inscription reads: "She Believed She Could, So She Did." Designers Note: The actual phrase appears as an "artistic interpretation" of the message. It is stamped on the ring and sometimes a word or two is blurred or upside down intentionally! The pieces are organic in nature and the artist is celebrating the beauty in the simplicity and imperfections. Sterling Silver jewelry stays clean if you wear it every day, but keep perfume and hairspray away from it. For cleaning use a simple jewelry polishing cloth and store your piece in a plastic zip-lock bag perhaps even with an anti tarnish strip. If you still notice tarnishing, try putting your piece in a glass bowl lined with tin foil. Dust the piece with baking soda and pour hot water on top. Use a soft toothbrush to remove it from the water and your silver should be shiny. Rinse off any remaining residue. Sizing could be very slightly off as this ring is not a perfect circle. Had to return as the words were not fully engraved on the ring. Couldn't read it. I originally ordered size 8 as my daughter likes to wear rings on more than her ring finger. When the 8 arrived, it was obvious it was too large, so I ordered the size 7. Honestly, I can't see any difference in the two. Both are too big. Neither are true to size. I understand this is a handcrafted item, but there needs to be effort made to use standard sizes. My daughter kept it and wears it on her pointer finger but it is not ideal. Great ring quality and meaning! I wear my ring all the time when my daughter doesn't take it on me. I finally decided she should have her own. All woman need to believe they can. I returned because the words were absolutely illegible on the ring we received. I recalled it from the past and searched for it! From the kitchen to the concert hall! It will lend me courage and motivation. In its' simplicity is beautiful and fits with any other jewelry. It is a Cinderella and I am its' prince. And I'm a woman and believe in women because they have willpower, sensibility, courage to love, initiate big events ( the souffragettes). This ring is a form of inspiring art from a true female artist ! Ashdod, Israel. Will a foreigner win?! Unfortunately, I will be returning this item - it didn't meet my expectations. It was meant as a gift for my closest friend, however I cannot give it to her, it's not what I had hoped for. The quality is poor. I wouldn't wear it myself. I purchased this for a friend, but I liked it so much that I bought a second one for myself. It's beautiful, subtle, and it reminds me that much is possible if you believe. Size was perfect! A gift for my daughter who achieved a milestone in her career. She loves it! I got this ring because I liked its message. However, I don't like how it uses unnecessary capitalizations, e.g., "So She Did" instead of "So she did" or "so she did," which is grammatically incorrect. Also, I would have liked the message to just be written out once instead of repeated, which it seems to be.